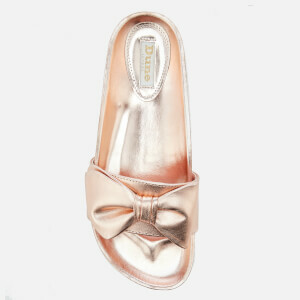 Women’s rose gold slide sandals from Dune. Crafted from faux leather with a metallic pink finish, the open-toe ‘Fenela’ sandals comprise a wide toe strap adorned with a decorative bow feature across the vamp. Set on a textured rubber sole for optimal grip, the shoes are finished with branding to the footbed.